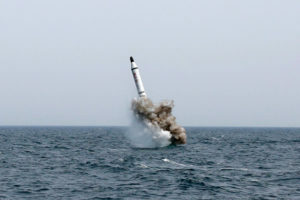 A submarine-launched missile that was successfully test-fired by North Korea last week likely was provided to the Kim Jong-Un regime by China, a U.S. analyst said. Test-fire of what North Korea calls its KN-11 missile. Bechtol said that China has a record of providing the North with military hardware, saying the North acquired transporter-erector-launchers (TEL), a vehicle used in carrying and launching missiles, from China in recent years.